I'm one of those cooks/bakers who can somehow manage to use dozens of bowls/pans/utensils to make one thing! I don't know how it happens or why, but I think it's genetic--my mother was the same way. My husband calls me the Black Tornado (as opposed to the White Tornado, from an old ad campaign for a cleaning product). Don't get me wrong. When I need to keep it under control, somehow I do. But the natural inclination is always there. After all, it's genetic. So a one-bowl cake is always nice. Though, of course, there is also a pan, beaters, sifter, measuring cups and spoons, spatula and cooling rack. When I first came up with this cake many years ago, I frosted it. No more. Just a simple dusting of powdered sugar at serving time and perhaps a dollop of whipped cream and a few berries if they're in season. No frosting means it's easy to freeze and have on hand for those times when even a one-bowl cake is too much trouble to make. Well, let me give you the back story. I first made gluten-free sandwich bread a year and a half ago with a great mix from a small company whose directions included cooling the loaf on its sides for the first 10 minutes. That is an important step because gluten-free bread lacks the structure of regular bread and tends to cave in at the sides a bit. So when King Arthur Flour sent me their taller, narrower 9x4x4-inch pan that is ideal for gluten-free yeast loaves, which require more support as they rise and bake, I immediately put it to the test. I made another loaf of the same bread I'd first tried a year and a half ago, but used the new pan rather than the standard loaf pan. It worked beautifully! No need to cool the loaf on its sides. I also liked the shape of the loaf and thought it would be perfect for my loaf cakes and quick breads. 1 Preheat oven to 350F/180C/Gas4. Butter and lightly flour a 9x5x3-inch or 9x4x4-inch loaf pan. 2 Onto a sheet of waxed paper, sift together flour, cocoa, salt and baking soda. 3 In large bowl, with electric mixer on medium, cream the butter. Add the sugars and continue creaming for about 3 minutes. Add the egg, and beat well. Add the buttermilk, coffee and vanilla extract. Add dry ingredients to wet ingredients. Mix on low just until blended; do not overmix. Note: If you don't have buttermilk on hand, just put a tablespoon of vinegar or fresh lemon juice in measuring cup and fill to the one-cup line with milk, stir, and let stand for 2 or 3 minutes. 4 Scrape into prepared pan. Bake for about 65 minutes, or until a toothpick inserted into the center comes out clean (or you get a reading of 210 to 215F/99 to 101C on an instant-read thermometer). Note: I cannot tell you how much I love, and how much I use for so many things, my Super-Fast Thermapen Instant Read Thermometer! 5 Cool in pan on wire rack for 15 minutes. Turn out onto rack and continue cooling for 2 hours. 6 Trim ends and slice into 8 to 16 slices. Malli, thank you! I hope you'll make it soon and let me know how you liked it. Thanks, Judy! Yeah, it's not enough to make the cake actually taste like coffee, just enough to accent the chocolate flavor. I love King Arthur products. I have their extra long loaf pan that I use for pound cakes. I always enjoy reading the catalog, and they have things no one else does, like english muffin molds. Glad you loved the pan! 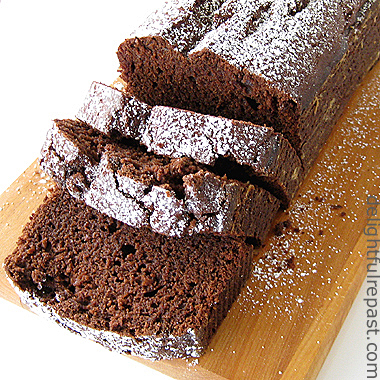 The chocolate loaf cake looks wonderful. I'm with Cranberry Morning. Coffee and chocolate are like rum and cola -- what am I saying, I hate rum and cola! Ah, well, I would very much appreciate it if you would just put the frosting you don't use on this in a bowl and leave it on your porch. I'll be me. P.S. I always loaf on my side, but I've never looked cool. Allison, I use my kitchen scale every day, but I have not yet switched over to scaling it in. Thinking about it! Sully, you're so funny! The frosting will be on the porch! Thanks, Charles! You know, now that you mention it, I think I managed to "clean up as I go" a bit better when my kitchen was smaller! Javelin, thanks. Your comment gave me a good laugh! I can just see it. Thanks, Abby. And loaf cakes go so well with tea. I think I'm going to try to make a vegan version of this (my daughter has a life-threatening dairy and egg allergies). Thanks for inspiring me to try out a new recipe! Thank you, Jennifer. This should translate quite well to vegan. I sometimes use organic canola oil in place of the butter, and there are a few good subs for eggs. Oh, what a perfect, moist cake! My chocoholics would love it. And thanks for the recommendation on an instant read thermometer...I've been less than impressed by the one I purchased at Wms-Sonoma. Lizzy, thanks! I just bought some more cocoa so I can make another one. You're going to love the Thermapen! This will become one of my favorites too...Really perfect and yummy looking! This looks great, Jean. I love my taller loaf pans. I haven't played with GF sandwich breads yet, but that is on my list to tackle soon. Mary, thank you. I really like the look of the slices with straight sides. Jean, I want to make this but baking soda is listed in the ingredients and baking powder is in the instructions. Which is it? Thanks so much. Jennifer, good catch! It's baking soda. Sorry for the confusion. Recipe says to preheat oven to 350 and later, to bake at 325. Which is it???? Thanks, Nancy! Glad you caught that so I can correct it. I just hate having typos and unclear directions in my recipes. The correct temperature is 350.